Tewksbury Mills: Dead in the Water? Yesterday’s announcement that Simon is mulling a purchase of embattled Mills Corporation has gotten me wondering about one of Mills’ stalled projects right in my own backyard: Tewksbury Mills. I’ve had an eye on this project for awhile. One of only two new enclosed malls currently proposed for New England, Tewksbury Mills was originally proposed in 2001 or 2002 as a 750,000 sqft, enclosed mall with an entertainment focus. The proposal followed a failed (and slightly more ambitious proposal) by Mills to build a mall on the site of the former South Weymouth Naval Air Station, 15 miles south of Boston. Instead, their focus shifted to the dense suburbs north of Boston, in particular the town of Tewksbury. With a population of nearly 40,000 and many other large suburbs nearby, the retail climate in the area is a bit unique for such dense suburbia. The proposed mall site is about 15 miles south of the New Hampshire border, and New Hampshire has no retail sales tax. As a result, the entire Merrimack Valley region of Massachusetts is somewhat under-retailed (in relation to its population) due to a string of large retail areas located just barely over the state line in New Hampshire, to take advantage of tax laws. The flip side of this, however, is that the populous towns south of the Merrimack Valley–which also includes several populous cities, such as Lowell (with 105,000 people) have to travel relatively considerable distances for more than basic shopping: shoppers either drive to New Hampshire, or south to the Route 128 beltway around Boston. With tax free shopping so nearby, however, there’s always been little hope for any large-scale retail to succeed. As a part of the entertainment component, Tewksbury Mills will contain a theatre complex and a two-surface ice skating facility. Mills has indicated its willingness to make ice time available to Tewksbury residents at a reduced rate. Although firm commitments have not been obtained from retailers for Tewksbury Mills, other Mills projects include factory outlet, off-price and full-price retailers and department stores. In the past, Mills has introduced many new and exciting retail concepts in its projects with retailers such as IKEA, Gibson Bluegrass Guitar Factory, Bass Pro Shops, Off Fifth-Saks Fifth Avenue, Last Call-Neiman Marcus and Crayola Works being but a few. A complete listing of all tenants in other Mills projects is available on the Mills Website, www.themills.com. As is to be expected, the mall proposal met with skepticism. Tewksbury Mills’ chosen plot had great frontage along I-93, but wasn’t adjacent to any major surface roads, and would necessitate the construction of a long-planned (and long-delayed) system of loop ramps and access roads called the Lowell Junction exit; the interchange would also serve to provide better road access to several office parks and an expanded commuter rail station on the Andover side of the freeway. In addition, residents of the town of Tewksbury were bitterly divided over the proposal, with many fearing increased traffic and damage to local businesses while just as many welcomed the increase tax revenue the mall could generate. The final proposed roadway system would not allow traffic to access any surface streets in Tewksbury, essentially orphaning the parcel (which exists on the far southeastern edge of town, near the Wilmington and Andover lines). Residents proved they were generally amenable to this plan, as it would have very little impact on existing traffic volumes in town. A very close vote to rezone the property for commercial use was approved in 2004, and it seemed Tewksbury Mills would become a reality. The below map is (like all images in this post) pulled directly from the official Tewksbury Mills site. 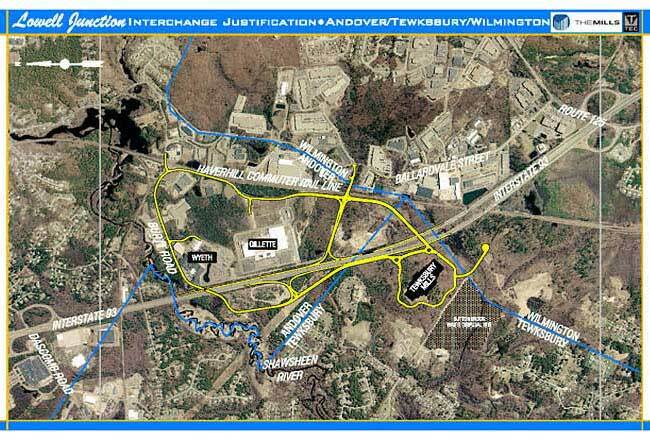 Note how elaborate the new roadway system is in relation to the mall parcel, and how most of it exists in the neighboring towns of Wilmington and Andover. Also, because the map is a bit confusing, left is north. Unfortunately, the Mills Corporation’s current financial problems and the state’s inability to construct the offramps speedily enough put the project back into jeopardy, and as it stands now the mall “exists on paper” but may never actually be built. The official website for the mall has been blocked for some time, displaying only the cryptic message that Mills is “updating their website.” While it seems there is a good chance there may still be retail development on the site, it’s seeming increasingly unlikely it will be built by Mills–and by extension, it’s probably increasingly unlikely it will be an enclosed shopping mall. Again, of course, I’m biased. If you want to read Mills’ (equally biased!) FAQ, you can still get to it on their site, as well as a few other pages. At this point, my guess is that this may be the end of the Tewksbury Mills proposal, but given our comprehensive coverage of the New England region, it’s interesting to note the mall that never was, or the mall that may still be. A Mills mall that is not 2-level? That’s uncommon. I meant to say, 2-level malls are uncommon. Ooops…I can’t believe no one noticed that for 2 months. i live in the next town billerica never heard of this! it would be nicer than going to burlington all the time. but what are the mills? I’m pretty sure this project is long, long dead. There’s still a possibility there’ll be retail on the site someday if those freeway ramps are ever built, but given the state of the economy and the fact that the original developer no longer exists, I doubt much of anything will be built on the Tewksbury site for many years. ah, such a great website. i’ve been binging on the mystic/woburn/billerica mall info (wish you had a story on harborlights, i grew up a few streets over). then this! the land belonged to my husbands’ extended family in a trust before it was finally purchased by mills corp. the property had launguished for decades with nothing planned and no one interested. i still don’t know if it will ever be developed, but the extended family is rid of it and my MIL got some money, thank god.